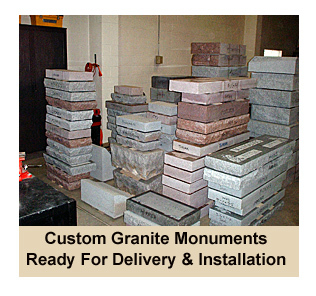 Rome Monument is a wholesale granite monument supplier that sells memorial products and provides value added services to monument dealers, cemetery management organizations and funeral homes. 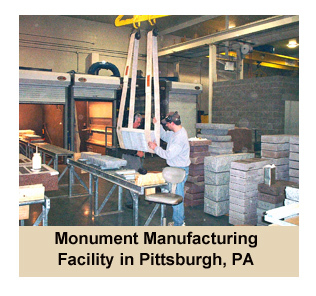 Our monument manufacturing facility is located in Monaca, Pennsylvania, just north of Pittsburgh. 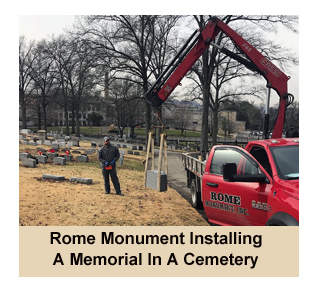 Rome Monument provides monument and mausoleum installation services for other retailers, cemeteries, funeral homes and death care companies throughout the continental United States. Rome Monument is one of the leaders in the cemetery monument and memorial industry. We wholesale granite headstones and cremation benches to retail businesses all across the United States. 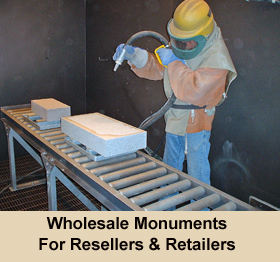 Rome Monument is a fourth-generation monument retailer as well as a wholesale, business to business (B2B), manufacturer of high end granite and bronze monuments and memorials. We distribute large quantities of granite headstones to other monument builders, cemetery supply companies, cemeteries and funeral homes located throughout the United States. We collaborate, and partner with, many different types of companies and organizations in the funeral service, cremation, memorialization and cemetery profession. If you are interested in talking with Rome Monument about our wholesale prices, memorial products and services, please call 724-770-0100 to speak with Vince Dioguardi or email info@romemonuments.com. One of main roles in the cemetery monument business is to improve the supply chain efficiency so that other monument dealers, memorial product distributors, cemeteries and funeral homes can effectively turn a substantial profit and provide a high level of customer service to the end users. We also help our wholesale customers by providing warehousing, delivery and installation services. Our wholesale customers are not required to meet order minimums or stock an inventory of granite markers and upright monuments. Our wholesale clients and distributors have access to our entire product line of memorial products and we have very short lead times for placing orders. We work hand in hand with cemetery supply manufacturing and wholesale distribution companies to provide exceptional quality inurnment, interment, entombment and inurnment products and services. Our wholesale customers which include funeral homes, can count on our efficient and on-time delivery and support services, national wholesale distribution facilities and competitive pricing. We wholesale cemetery accessories, lawn crypts, burial vaults, mausoleum crypts and columbarium niches. Rome Monument sells cemetery monuments and mausoleums to other memorial retailers and certified memorialists, cemeteries and funeral homes in the New York metropolitan area at wholesale prices. Rome Monument sells individual mausoleums and private estate mausoleums to cemeteries, funeral homes and monument dealers in San Francisco Bay Area cities such as San Francisco, Fremont, San Jose, Santa Clara, Concord, Oakland, Hayward and Sunnyvale. Rome Monument is one of the most honest and reliable monument wholesale distributors in the United States and has been selling granite headstones at wholesale prices since the 1930s. Very few monument wholesalers also offer delivery and installation services all across the United States, as does Rome Monument. If you are interested in becoming an authorized dealer of memorial products manufactured by Rome Monument, please call 724-770-0100 to speak with Vince Dioguardi or email info@romemonuments.com. We supply both low priced and high end granite monuments in a wide variety of colors to resellers such as cemetery management companies, funeral homes and other monument dealers at discounted prices. 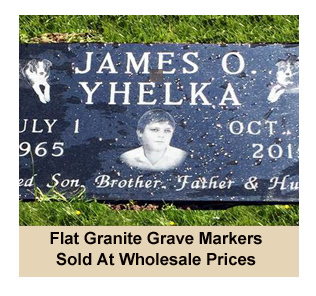 To learn more about granite headstone prices, click here. When we sell granite monuments to other companies and organizations, we offer a substantial discounts. We provide monument installation and grave marker setting services in conjunction with our wholesale customers. Because we are one of the largest privately owned monument companies in the United States, we receive substantial discounts when we purchase domestic granite or imported granite from overseas. We then pass on our savings to our other monument firms, funeral homes and cemetery management businesses. We partner with churches and cemeteries to provide community columbariums for cremation. We work in a very collaborative fashion to ensure that our customers (cemeteries, funeral homes and monument dealers) sell our products and services in a professional and profitable manner. Our monument production, processing and manufacturing facility is located in Monaca, Pennsylvania, just north of Pittsburgh. 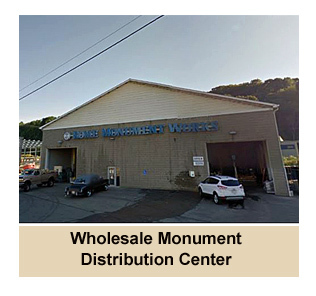 This facility is also the monument wholesale distribution center where monuments and grave markers are produced and shipped to monument dealers, Catholic cemetery associations, funeral homes and end users/end consumers. We have even been know to volunteer our services to help clean vandalized headstones in cemeteries. We sell thousands of granite headstones every year to both individual customers and resellers. Watch a video on Youtube to learn more about the types of cemetery monuments we wholesale and general price ranges. Since the 1930s, we have been manufacturing gravestones and gravemarkers from the highest quality imported and domestic granite. We are also a Rock of Ages Corporation dealer. We purchase massive quantities of granite, in many different colors, from this granite quarrying and finishing company located in Vermont. The company, founded in 1885, manages the world's largest "deep hole" granite quarry. We also import mutiple intermodal shipping containers filled with granite from China each month. The wholesale cost of granite from China is significantly less than granite quarried in Vermont, Wisconsin, South Dakota, Massachusetts, Georgia or North Carolina. Some of the largest open-face granite quarries are located in Georgia. Our black granite monument designs are extremely popular. Rome Monument provides monument and headstone design services for retailers. Upon request, we design unique granite memorials, in wide array of shapes and sizes, using a computer aided design program (CAD) and then email the finished drawing to our wholesale customers. We can even manufacture grave markers and upright headstones that incorporate porcelain pictures and small inlay ceramics in the artwork. We are also one of the premier designers and manufacturers of veterans memorials in the United States. Our customers, such as funeral directors, monument company owners/managers and cemetery sales reps show these designs to their customers. Once the design is approved and a contract has been signed, we then craft the monument and ship it to the reseller, or in some cases, actually install the monument or marker. Click here to browse pictures of monument designs by the type of artwork. We also work with architectual companies, landscape architects, contractors, interior designers, residential and commercial construction companies to create historical landmarks, community memorials, plaques, signs and other granite and stone projects. Rome Monument sells cremation benches to families, cemeteries, funeral homes, memorial parks and other monument retailers. Wholesale orders for cremation benches can be place by calling 724-770-0100. Because Rome Monument employees in-house memorial designers and operates our own manufacturing facilities, we are able to supply grass markers, headstones for memorial parks and cemeteries and funeral monuments to many types of firms in the death care industry. Because we own and operate our own monument setting trucks that use corner-mount telescopic cranes, hydraulic cranes and articulating cranes, we are able to provide monument installation and setting services for our wholesale customers. We also have a network of monument installers and monument shiping partners across the United States. To view examples of the memorial products we wholesale, click here to browse our Design Gallery. We design, manufacture, etch and carve granite monuments for our wholesale customers. Free monument design software (CAD) for point-of-sale resellers. We provide free monument design software to other monument dealers, cemetery managers and funeral home directors so that they can design and sell the memorials we manufacture on their behalf. Monument and headstone design services for retailers and resellers. 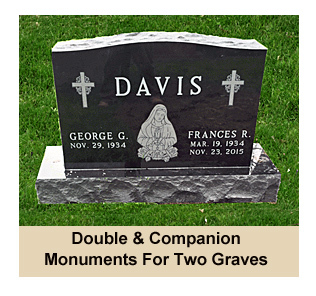 Granite markers, bevels, slants, civic memorials, mausoleums, columbariums (columbaria), granite memorial benches, pet memorials, estate and family monuments and upright monuments. Monument and headstone installation and setting services for retail businesses. We deliver and install memorials and monuments in cemeteries and memorial parks all across the Unites States on behalf of our wholesale customers. Rome Monument works with churches, cemeteries and memorial gardens to design and manufacture columbariums/columbaria, private family mausoleums and crypt style mausoleums. 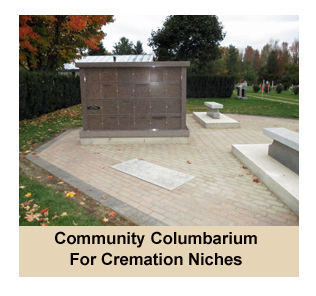 We also supply churches and cemeteries with community columbarium for cremation niches. To see examples of our work, click on the links below.